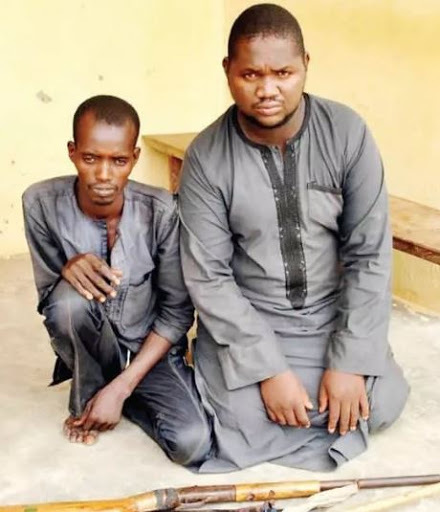 An arrested armed robber, Hussaini Dikko in Niger state says him and his accomplice was only arrested because Allah Destined them to be arrested. The suspects: Usman Diko and Usman Umar were arrested after robbing residents of Wawa, New Bussa. According to Northern City News the suspects engaged the police in a gun duel before eventually been arrested. “We opened fire to scare them to enable us to take to our heels but unfortunately they wounded one of us during the exchange of gunfire and consequently arrested us. “Allah has destined that they will catch us, so there is nothing anybody can do about it. We have accepted our fate, so let the law take its course,” he said. The Command Public Relations Officer, Muhammad Abubakar, said the suspects confessed to the crime. He said the operatives recovered from them one single-barrel gun and cutlasses, adding that the suspects would be charged to court after investigation. 0 Response to "‘Allah Destined Us To be Arrested’- Says Armed Robbers Arrested for Robbery in Niger (photos)"